When Stan first started weight training he found that he had a weak back easily injured so he took Arnolds advise and began deadlifting once a week. training in the late 70s early 80s. Once Stans back became strong he didn't deadlift for over 30 years. Stans back remained strong during his whole life. As time went on Stan began to become inspired by others who were deadlifting in Stans Gym. Over the last year Stan who is 60 next birthday decided to begin deadlifting once a week again as part of his overall bodybuilding training. Stan says its amazing how great lifting makes us feel. When Stan first began benching he tried to bench 120 1bs. Stan says that he waited for the gym to be empty and with two of his friends they loaded the bar. First Nigel Black nearly got it, then Kim Ford nearly got it. Stan says that he was determined to beat them. Stan lay on the bench, gripped the bar, lowered and exploded and couldn't quite straighten his arms. Benching has always been a fascination to Stan. Stan says he remembers being inspired by old men in the gym lifting weights that would have crushed him at that time. Stan remembers the owner of the gym at Perfecto Health Club. This man looked like an old grandad but was benching 220 1bs for reps with ease. It was right then Stan thought. That's what I want to be like when I am old. NOT EVERYONE WANTS TO BE A COMPETITIVE BODYBUILDER ! 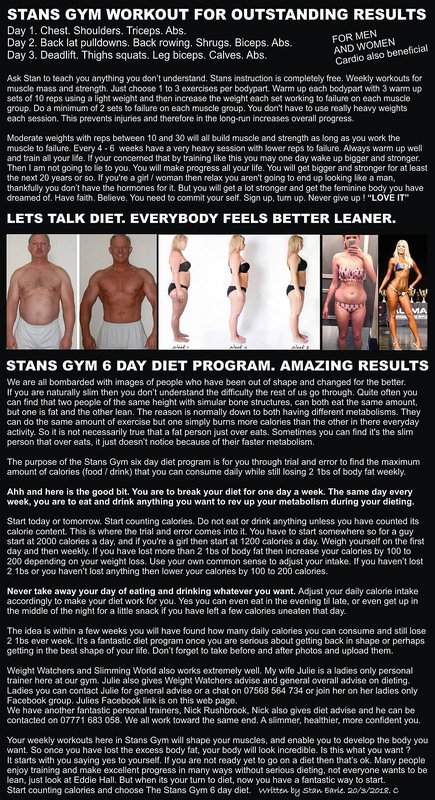 STANS GYM WEEKLY WORKOUTS BUILD MASS / STRENGTH. BUT IF YOU ARE READY TO STEP IT UP ARNOLD STYLE. HAVE LEARNT HOW TO TRAIN FROM ARNOLD. IS THE QUICKEST WAY TO GET INTO SHAPE FOR ANYONE.